Antique Country Home Decor is a category that envisions making use of such rustic antiques in unique ways to enhance the look of your home both inside and outside. If you are able to make use of such antique "finds" yourself and create masterpieces, that is well and good, but if you are not that talented, you can find such delightful additions online. One of a kind glazed art pieces showing a great love of nature are formed in flat and collage designs from antique architectural ceiling tin tiles collected over 30 years by artist Lori Daniels and Antique Picker Steve White. Lori feels that the most important thing in this very different art form is the combination of colors used to later become the perfect focal point in a customer's Shabby Chic decorating scheme. Each piece even states its building location and history! This is another folksy art featuring cheerful metal Sun Faces to decorate walls in your home or on the exterior of your patio or garage. Placing such boxes under the exterior of windows brings gardening to a more visible place and gives a place to put fall and winter decorations during off season months. Many sizes and colors are available. If desired, a Dark Green Moisture Mat Plant Liner that can keep your soil moist longer can be cut to fit. 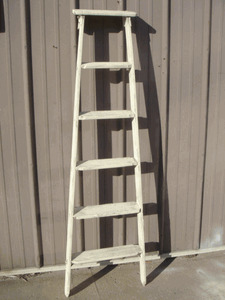 Add to your country decorating with a decorative wooden ladder. This is an unusual way to display favorite collections. Another idea for a great eclectic look is to have long ladders cut to size so that they can be turned into unique bookshelves. Place the ladders in a row and add wooden boards to connect them.